Here's a thread for the demolition of the current greyhound station as well as the construction of Tower B in Ice District as requested by some readers. Party in June at Denizen to celebrate the beginning of this part of the project. I'm down for some b-arcade time! How realistic is this project to go ahead at this massive scale (after the demo) considering the current economic climate? Of course, I really want it to like everyone else but trying to temper my expectations. The economic climate of Katz/Durstling is super and this will go forward. The parkade/podium is 99.999%, the tower could wait if they wanted. Or they could retarget depending on the market. I think given the war chest they've got and given labour, electricity and fuel cost drops they would be looking at this time frame as a positive one as opposed to a climate where those same costs are substantially higher. I think the tower is quite important to the success of the stores in the podium, a grocery store for example. They need as many people as possible to patronize it at all times of day. Though stantec, ultima and the hotel towers will add people, this would provide another ~500 people that could frequent it. So this is officially 43 stories then? I recall seeing on social media that they had cut down 8 floors? The latest stats I heard a few days ago was that Alberta's unemployment rate was below Quebec's for the first time in 30 years, but Edmonton is still isolated from this plethora of insidious misfortune by gaining 1200 jobs. If you look at the trend Katz/Wam did not release anything official till the unveiling . I suspect some toying around is going on. I can see this project going through as this will be one of the focus areas of the city for quite awhile. And the cool thing is this other tower could convince others to further invest in the downtown. As each project moves forward it gives more developers and businesses confidence that downtown Edmonton is the place to be. I would wait till WAM releases more info on the tower; the floor count is still speculative but this is where I went for some quick tidbits. This entire development is interconnected and I can't foresee a reality in which the tower gets delayed, much less not go ahead. As others have mentioned, the retailers might have clauses in their lease requiring it, the parking revenue (at least a portion of) is dependent on it. Other projects might sputter in this economy, but not this one. It's been reduced to 42ish floors, is my understanding. But I doubt anything's finalized, given that they're still working on finishing design and tendering for the JW and Stantec towers. Basically, same number of suites, but reduced height and bit larger of a footprint. I wonder if it allows them to build a bit faster, because the piles won't take as long for a bit of a shorter building? Geotech assessment and recommendations? I can't imagine they want this to be an active construction zone for longer than it needs to be. That depends on soil condition below it. I strongly believe the original height will remain. Once the arena commence action, I can see excitement and momentum to be accelerated. As is- unfinished- I see and feel excitement on the street already. That should spur more interest in the tower. Yeah but it also literally says it's just an approximate measurement of 40 stories. So give or take. I just hope we get more color in our skyline. Red tinted glass would be cool. Be careful what you wish for. They might copy the unfinished barber shop tower I can see out my window and alternate colours every floor. Good idea but kinda unhappy that they had to move Greyhound out to Yellowhead. Oh well, gentrification it is, I suppose. Perish that thought immediately! That terminal attracts the deviance- not the customers- and the last thing we want is to have them take over the Winter Garden as their playground. What is the resident population of the Greyhound terminal? About 9 to 15 lol. Gentrification applies to the businesses of a lower income area as well. But, it is unfair to characterize everyone who takes the Greyhound as lower income, because they aren't. Also, Greyhound is a subsidiary of multinational British company FirstGroup. So it's not like this is pushing out some local shopkeep. Gentrification is a trend in urban neighborhoods, which results in increased property values and the displacing of lower-income families and small businesses. While I personally dislike Greyhound and the poor service they provide, it would have been better to keep a terminal in the core. It is important for the goal of having a multi-modal transit station. I agree that an urban terminal worked into the parkade would have been a good idea. The ideal would be having a terminal that services all bus companies, though. When I was in Stockholm I was amazed at how closely together they'd managed to get the central train station, the central bus terminal & the central subway station (along with the airport train). Literally all within a couple blocks. It was awesome to get into & around the city. Blatchford, the city's future model for transit integration, is going to be right next door to the new Greyhound/Via Rail terminal. Do people think that the CoE will not try to better integrate the new terminal in with ETS while developing Blatchford? They pretty much have a blank slate to work with up there. If they keep cutting routes, they won't be that far behind Red Arrow, who are slowly adding more routes. The City's ability to avoid doing the painfully obvious right thing is remarkable & all-encompassing. As I've said before I would have loved to have seen the city take some leadership here and have brought together the different parties to discuss the possibility of an urban, multi operator, multi modal transit station. Something like that would have encouraged transit modal shift in a large way simply due to the convenience of such an option. However seeing that something like that is not even in the cards I would at least like to see that the various bus carriers are included on a high frequency bus route with easy access to the lrt network which in blatchford should not be hard to do. Please do not reduce height below 40 storeys. The world is full of kings and queens, who blind your eyes then steal your dreams. The original height planned please! I don't know how many towers will be constructed as tall or taller than JW after this innitial wave of " skyline on steroids " movement. This needs to be visible from the south view as Encore will be the same height. Stantec Tower will be the "Empire State Building" of Edmonton. Tallest for decades to come. Stantec Tower will be the "Empire State Building" of AlbertaTallest for decades to come. Oxford Place will be taller. No he's talking about Oxford; Brookfield won't be as tall as Stantec. I'm not so certain Oxford is ready to invest in such a tower in Calgary right now however. That city is dealing with a plethora of vacancies and commercial space continues to grow. I'd love to see it as it's a beautiful building - I just don't think it's an equitable project. Oxford won't get built Calgary has so much empty office space . I don't see anymore office towers built for at least a decade. That's what they said about other towers during busts in the past, including The Bow. Planes, trains and automobiles keep on burning fuel tho. I'm old and I have seen booms and busts over and over. A couple of years and everything will be filling up again and new ones coming up. Trust me. The last one was a bank implosion. In this case it was the market that made oil profitable that imploded. There is a substantial difference in those kinds of recovery times. I don't know enough about the induvidual companies in the Calgary market, but generally I wouldn't try to predict something so micro as a single company wanting to upgrade or consolidate on something so macro as the provincial economy. I would venture Oxford Tower wouldn't be built on speculation at this moment, but if Calgary has a significant proportion of antiquation like we do, that can change quickly like Drumbones says. Most of what I see in the macro Calgary office market is renewal of the 70s-'80's era towers into more efficient forms. Same as Edmonton, only we're so far behind, despite being half the size market, there might be just as much potential for us to see another tower as them. Not sure if you're arguing it is or it isn't gentrification, but the key you've indicated is that Greyhound's customers are mixed income. Meanwhile it's just a transit point, but except to its employees who are not marginalised, neither an origin nor destination unto itself. Realistically, the vast majority of people we're talking about being displaced are not going anywhere unless the 105 Avenue social agency supercluster begins to disperse (and if that's gentrification BTW, I'm all for it.) Most of the people we're discussing who have been in/around the Greyhound terminal had nothing to do with the business per se. Ian and another member are dropping rumours that this tower is going higher again. Perhaps Ice District was trolling us. It would be wise with the high sales volume in legends. I'm excited to see what's in store for Phase 2. This all bodes well for other CRL impacted areas too. More return on our buck and bigger and better projects to be coming. ^ I suspect we won't hear about phase 2 until 2017 or 2018, but it will be exciting. Greyhound will be moving out soon, and they've already been doing work in the alley behind, looks like shoring. I expect that the building will be down and gone by the end of May, and they'll start digging right away. They'll be in a position to be putting in foundations by the end of summer so the structure design massing and height envelope will be finalized by then, based on how they've announced and marketed their first 3 towers I expect we'll see a lot more around then. Excavation won't be done on this until January according to a post by Virex in another thread. Lines up with how long it took them to excavate the Stantec/hotel pit down that far. He has been pretty bang on with timelines on the entire Ice District and is the one that shared the entire Stantec skeleton picture. I imagine we'll see an announcement for this tower in the summer though as they have already teased about it on their Instagram and Facebook pages. I can't see phase 2 getting announced until quite a while after this tower though. Greyhound comes down in June and excavation will be finished on phase two (greyhound site) by January 2017. Last edited by Moodib; 05-04-2016 at 01:43 PM. I heard Greyhound will be demo'ed by July. Good riddance. Greyhound has to move out, remediation has to take place...this takes time and considering we are already in April that's only 3 months away. Ya, like I said, I'm probably asking too much. I just can't wait to see it go. Description:	To demolish a Fleet Services and Restaurant Use building (GREHOUND BUS DEPOT and A&W). As much as what's replacing it might be good, and even though everyone around seems gleeful with the proceedings, I for one feel sad in the passing of downtown's intercity bus terminal. I guess I'm getting old. I remember when they built this place. Believe it or not, it was seen as fairly impressive at the time. And, more importantly, even though Greyhound doesn't seem interested in it, we should *want* a downtown bus station. Unlike a downtown train station (which I'm also sad we've lost, but that one's too long gone to fret about now), buses are still, or at least should be, an option. So, sure, let's look forward to the shiny tower we (probably) will be gaining, but let's also see that we're losing something. And something that we could, and I think *should* find a way to replace, be it with Greyhound's involvement or not. One of the most beautiful things I've seen this year. I would pay to help. you aren't wrong. I love what is happening downtown but i still wonder if we couldn't have maintained a multi modal train/bus/transit depot under the CN tower somehow. Water under the bridge now for sure and i'm more than happy with what is happening. not all cities have downtown inter city travel access... and we need to build a demand for it before it could ever have happened. A grand central terminal with VIA Rail, greyhound, red arrow, various smaller shuttles, room for travel groups that do ski tours, central pickup/drop off for industrial shuttles, taxi spots, ride share spots, uber/tappcar/modern pick up service pickup, LRT, city buses, transit buses from sherwood park/st albert, at a potential HSR spot, with an attached mall of some kind and a package pick up point for fedex, ups, canadapost, amazon/ikea pick-up, DATS, and any other bus or transit providers that want in. Losing grey hound has it's negatives. But the current way the grey hound was running wasn't being helpful for the area. no question, i wouldn't trade. once in awhile i like to live in my alternate universe. Greyhound was a magnet for many unsavoury people...sorry, but it was. no conditions or decisions have only one consequence. Once again, i will be as happy as anyone that the GH station is gone and it is the only path forward. The Greyhound station demolished some impressive brick warehouses when it was built. I wish that building was never built in the first place. is greyhound bus station demolished yet ?? Greyhounds lease ends in May and it is expected to be demolished immediately. Done by Canada day. ^ actually Rollerdrome was on the Stantec/Marriot block, on the corner of 102 Street and 104 Ave. Indeed. Just imagine if Marshall Wells was still around (including the rooftop water tank), and was repurposed into what Mercer Warehouse is doing today! Exactly - good riddance - that building added ZERO to our economy and the people it attracted are not wanted in our new beautiful utopian ice district...glad they are banished to the Yellowhead. We are not alone...ever been to the Greyhound terminals in large American cities? Too much scum and villainy. It will good to see it go..
Last edited by Franky Knuckles; 10-04-2016 at 12:28 PM. The rooftop corner of city centre parkade is my favorite place to people watch. Greyhound sure can make for some entertainment but I suppose a VIP theatre and what'll probably be a 50 story tower will be a little better. Welp. It doesn't get much more naked than this. ^ I thought it might have been anti-arena sarcasm. maclac misunderstood what I was saying. There are also in-road works before the excavation of the parkade/greyhound lot can occur - remember, there is power, streetlighting, gas, water, sewer, storm, etc. in the road. Those don't mix well with multi-story deep parkades. The opinions and views posted are my own and do not reflect the opinion, views, philosophies, policies, etc. of my employer, its board of directors, or its shareholders. ^You're absolutely right, utility realignments/relocations/removals are major components that I forgot to mention. Major only if there are relocations, but I doubt that there would be - there are no properties that have to have service maintained so local service can be cut off quickly and easily, and the main services are under other streets. Trunk sewers for the area are under 105st, power is, I think, under 104st from the substation at 104st and 105-106 aves. I'm not sure where fibre is but 103st seem unlikely to have much. Telus subs were doing a ton of work on 104th Street last year and earlier this year. My guess was fiber work considering the equipment that was being used. If you look at photographs of the northern part of downtown taken around the middle of the 20th century, one building always stands out, towering above the district. With its giant rooftop water tower, the eight-storey Marshall-Wells Building at 10260 103rd Street was a longtime Edmonton landmark. 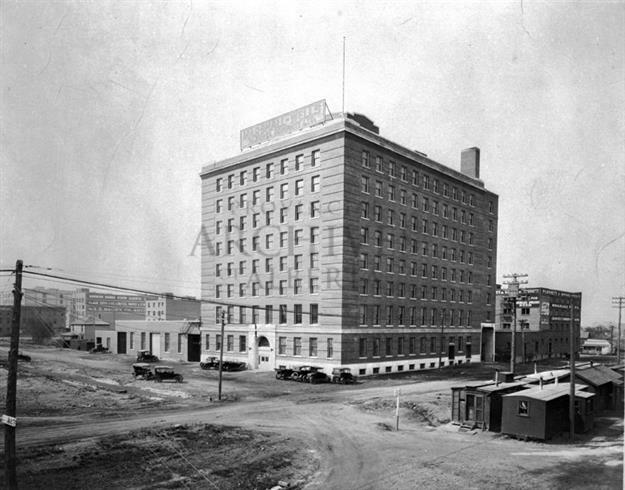 When it was completed in 1921, it became the tallest building in the city, one storey higher than the McLeod Building, which was completed in 1915 at 10136 100th Street. The Marshall-Wells Building remained height champion until 1966, when the CN tower was completed. It survived another 13 years, and was knocked down to make way for the new Greyhound Bus Terminal. Another Ghermezian legacy, the lost Marshall-Wells building. there is a big bundle of fibre that drops into CCM west where the rogers data centre is. There are also waterlines. The closure of 103rd and the deep parkade means they need to be rerouted to maintain fire protection in the area. The old lines can't come out until the new are in, and that takes time. Utilities through buried structures is frowned upon due to risk, liability, accessibility, and maintenance concerns. Also, this area is riddled with lines no one knows about, or aren't where records show - a legacy of the owners of the lines, the age of the lines, or just general "get it in" attitudes of the past. Every excavation in the area is a bit of an adventure. ^that argument may have held weight at one point, but with the sensors and technology available you should be able to get a damn good idea of what's underground without having to turn any soil. Can you give examples. I think the complicated process is the digging part if indeed it is a maze below. Last edited by ctzn-Ed; 18-04-2016 at 11:29 PM. Nope, not an easy thing to do. How do you know a plastic pipe is water or sewer? Or maybe it's abandoned? You simply can't tell from above ground with current technology that's readily available. A few years ago I was involved in the SLRT utility relocates and we had problems finding a water line. The drawings showed it in the median on 111th, but we couldn't find it with the hydrovac truck. We brought in ground penetrating radar, but they had difficult locating it as well. GPR doesn't work well in clay, which we have a lot of. Thank you! Out of curiosity, how was it found? ^The honest answer is, the drawings were wrong. Actually what a closer review of the drawings showed is that this larger water main had a valve chamber that was accessible via a manhole lid. In the field, the manhole lid was actually in the lane, and therefore that's where the water main was. We eventually hydrovaced it again in the lane to confirm the location. LOL... that is funny. I actually see that delima quite often when I'm at an oil plant sight. Granted they're not underground but high up in the mods. Same here. Ive been asked to do Ultrasonic inspections at petro chemical or power plants and given ISO drawings to find the line..
Hey you guys dont have this line anymore!! Been gone for years! Seeing some people count spires as part of the building height perhaps the water tank also counted to the height. Perhaps Katz could recreate the Marshall Wells facade in Tower B (it's a dream but sometimes they come true). I also hope the Greyhound site doesn't have much remediation problems. Spires will definitely be considered as part of the overall height. I wouldn't mind a communication tower in a format of spire. I wouldn't mind either. Both the Willis Tower (Sears Tower) and Hancock Tower in Chicago have spires on them. I'd call either antenna, same with the Freedom Tower and not count it, things like Burj Khalifa or the Chrysler Tower I'd count. But regardless would be nice to see recreation of an old facade. If Mercer had a rooftop patio, we could have had a C2E meet up to watch the demo of the Greyhound.